Complete exhaust yamaha yp 500 t-max 2008> 2011 arrow dark carby tech race. Full exhaust race tech yamaha yp 500 t-max 2008> 2011 complete line 2x1 / stainless steel collectors ref. 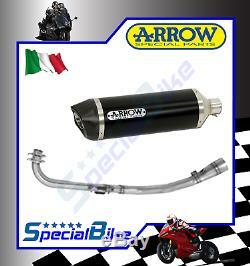 71390mi dark aluminum silencer / carbon cup / approval ce / db killer / ref. 71806akn original position / ready to mount race-tech mufflers were the first of rhomboidal shape, they replaced the old round or oval shapes. This innovative volume profile has reduced clutter compared to traditional shapes and significantly reduced weight without compromising performance. The internal components are stainless steel assembled to the tig. The gas flow section profile is calculated and rigorously controlled to optimize flow. A particularity of this exhaust is the rear part which has been studied for a direct exit of the gases to avoid the counter pressures. Race-tech mufflers are homologated with removable db-killer for the entire motorcycle range. They are available in titanium, carbon or aluminum. For any bike, the titanium silencer is also available with the carbon rear part. If the item is not stored in our premises, shipping will be subject to availability at our producer with a shipping time within 10 to 15 business days. The photos do not relate specifically to the proceeds of the sale. The product is invoiced and guaranteed by the producer. Any shipment outside the European Union may be subject to an opening and inspection procedure by the customs authorities. Please note that when you are in command, you are considered as the official importer and must respect all the laws and regulations of the country where you will receive the goods. Deadline: the shipping is carried out by the carriers ups, dhl or sda with delivery and calculated on the basis of the weight and the dimensions of the parcel, under 3/4 working days. In case of multiple purchases, it is imperative to group your items before any validations of payment. The purchaser has a period of withdrawal and refund of the amount. The delivery delay usually varies within 3 to 10 business days. In this context, all costs incurred for the return of the order will be entirely the responsibility of the buyer. In case of return: all costs are the responsibility of the buyer and will they be deducted from a possible refund. The products offered for sale are described and presented by the photos provided by the producer or the supplier of the object, with the greatest possible accuracy. However, if errors or omissions may have occurred regarding this presentation, the responsibility of specialbike could not be engaged. We cordially invite buyers to control the data on the producers' sites. All photographs or images reproduced in this site, even if for information purposes, may not refer to the exact object for the different applications. The purchaser is kindly requested to pay the payment of the object within 4 days from the purchase. Otherwise, the item will be put up for sale and the seller may report a dispute for unpaid item. The feedback is left after the buyer. Before leaving us any evaluation neutral or negative, we ask you to kindly contact us, we will do everything possible to help you as soon as possible. Please do not leave rating below 3 stars which are negative for the seller. Or contact us by phone. A unique number is at your disposal to serve you better. The item "complete exhaust yamaha yp 500 t-max 2008 2011 arrow race tech dark carby" is for sale since Monday, October 9, 2017. It is in category "auto, motorcycle parts, accessories \ motorcycle \ spare parts \ systems" exhaust, silencer, deflectors.Alfio" and is located in torre del greco. This item can be delivered anywhere in the world.